An electric motor converts electrical energy into kinetic energy. The reverse task, that of converting kinetic energy into electrical energy, is accomplished by a generator or dynamo. In many cases the two devices differ only in their application and minor construction details, and some applications use a single device to fill both roles. For example, traction motors used on locomotives often perform both tasks if the locomotive is equipped with dynamic brakes. Most electric motors work by electromagnetism, but motors based on other electromechanical phenomena, such as electrostatic forces and the piezoelectric effect, also exist. The fundamental principle upon which electromagnetic motors are based is that there is a mechanical force on any current-carrying wire contained within a magnetic field. The force is described by the Lorentz force law and is perpendicular to both the wire and the magnetic field. Most magnetic motors are rotary, but linear motors also exist. In a rotary motor, the rotating part (usually on the inside) is called the rotor, and the stationary part is called the stator. The rotor rotates because the wires and magnetic field are arranged so that a torque is developed about the rotor's axis. The motor contains electromagnets that are wound on a frame. Though this frame is often called the armature, that term is often erroneously applied. Correctly, the armature is that part of the motor across which the input voltage is supplied. Depending upon the design of the machine, either the rotor or the stator can serve as the armature. Electric motors of various sizes. Rotor from a small 3V DC motor. This motor has 3 coils and the commutator can be seen at the near end. One of the first electromagnetic rotary motors was invented by Michael Faraday in 1821 and consisted of a free-hanging wire dipping into a pool of mercury. A permanent magnet was placed in the middle of the pool of mercury. When a current was passed through the wire, the wire rotated around the magnet, showing that the current gave rise to a circular magnetic field around the wire. This motor is often demonstrated in school physics classes, but brine (salt water) is sometimes used in place of the toxic mercury. 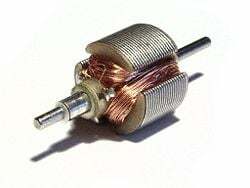 This is the simplest form of a class of electric motors called homopolar motors. A later refinement is the Barlow's Wheel. Another early electric motor design used a reciprocating plunger inside a switched solenoid; conceptually it could be viewed as an electromagnetic version of a two stroke internal combustion engine. Thomas Davenport built a small DC electric motor in 1834, using it to drive a toy train on a circular track. He obtained a patent for it in 1837. The modern DC motor was invented by accident in 1873, when Zénobe Gramme connected a spinning dynamo to a second similar unit, driving it as a motor. The Gramme machine was the first industrially useful electric motor; earlier inventions were used as toys or laboratory curiosities. A simple DC electric motor. When the coil is powered, a magnetic field is generated around the armature. The left side of the armature is pushed away from the left magnet and drawn toward the right, causing rotation. The armature continues to rotate. When the armature becomes horizontally aligned, the commutator reverses the direction of current through the coil, reversing the magnetic field. The process then repeats. The permanent magnets on the outside (stator) of a DC motor may be replaced by electromagnets. By varying the field current, it is possible to alter the speed/torque ratio of the motor. Typically the field winding will be placed in series (series wound) with the armature winding to get a high torque low speed motor, in parallel (shunt wound) with the armature to get a high speed low torque motor, or to have a winding partly in parallel, and partly in series (compound wound) for a balance that gives steady speed over a range of loads. Separate excitation is also common, with a fixed field voltage, the speed being controlled by varying the armature voltage. Further reductions in field current are possible to gain even higher speed but correspondingly lower torque, called "weak field" operation. If the shaft of a DC motor is turned by an external force, the motor will act like a generator and produce an Electromotive force (EMF). This voltage is also generated during normal motor operation. The spinning of the motor produces a voltage, known as the counter-EMF (CEMF) or back EMF, because it opposes the applied voltage on the motor. Therefore, the voltage drop across a motor consists of the voltage drop, due to this CEMF, and the parasitic voltage drop resulting from the internal resistance of the armature's windings. Since the CEMF is proportional to motor speed, when an electric motor is first started or is completely stalled, there is zero CEMF. Therefore the current through the armature is much higher. This high current will produce a strong magnetic field which will start the motor spinning. As the motor spins, the CEMF increases until it is equal to the applied voltage, minus the parasitic voltage drop. At this point, there will be a smaller current flowing through the motor. Generally, the rotational speed of a DC motor is proportional to the voltage applied to it, and the torque is proportional to the current. Speed control can be achieved by variable battery tappings, variable supply voltage, resistors or electronic controls. The direction of a wound field DC motor can be changed by reversing either the field or armature connections but not both. This is commonly done with a special set of contactors (direction contactors). The effective voltage can be varied by inserting a series resistor or by an electronically controlled switching device made of thyristors, transistors, or, formerly, mercury arc rectifiers. In a circuit known as a chopper, the average voltage applied to the motor is varied by switching the supply voltage very rapidly. As the "on" to "off" ratio is varied to alter the average applied voltage, the speed of the motor varies. The percentage "on" time multiplied by the supply voltage gives the average voltage applied to the motor. Since the series-wound DC motor develops its highest torque at low speed, it is often used in traction applications such as electric locomotives, and trams. Another application is starter motors for gasoline-powered and small diesel engines. Series motors must never be used in applications where the drive can fail (such as belt drives). As the motor accelerates, the armature (and hence field) current reduces. The reduction in field causes the motor to speed up (see 'weak field' in the last section) until it destroys itself. This can also be a problem with railway motors in the event of a loss of adhesion since, unless quickly brought under control, the motors can reach speeds far higher than they would do under normal circumstances. This can not only cause problems for the motors themselves and the gears, but due to the differential speed between the rails and the wheels, it can also cause serious damage to the rails and wheel treads as they heat and cool rapidly. Field weakening is used in some electronic controls to increase the top speed of an electric vehicle. The simplest form uses a contactor and field weakening resistor, the electronic control monitors the motor current and switches the field weakening resistor into circuit when the motor current reduces below a preset value (this will be when the motor is at its full design speed). Once the resistor is in circuit, the motor will increase speed above its normal speed at its rated voltage. When motor current increases, the control will disconnect the resistor and low speed torque is made available. One interesting method of speed control of a DC motor is the Ward-Leonard control. It is a method of controlling a DC motor (usually a shunt or compound wound) and was developed as a method of providing a speed-controlled motor from an AC (alternating current) supply, though it is not without its advantages in DC schemes. The AC supply is used to drive an AC motor, usually an induction motor that drives a DC generator or dynamo. The DC output from the armature is directly connected to the armature of the DC motor (usually of identical construction). The shunt field windings of both DC machines are excited through a variable resistor from the generator's armature. This variable resistor provides extremely good speed control from standstill to full speed, and consistent torque. This method of control was the de facto method from its development until it was superseded by solid state thyristor systems. It found service in almost any environment where good speed control was required, from passenger lifts through to large mine pit head winding gear and even industrial process machinery and electric cranes. Its principal disadvantage was that three machines were required to implement a scheme (five in very large installations, as the DC machines were often duplicated and controlled by a tandem variable resistor). In many applications, the motor-generator set was often left permanently running, to avoid the delays that would otherwise be caused by starting it up as required. There are numerous legacy Ward-Leonard installations still in service. A variant of the wound field DC motor is the universal motor. The name derives from the fact that it may use AC (alternating current) or DC supply current, although in practice they are nearly always used with AC supplies. The principle is that in a wound field DC motor the current in both the field and the armature (and hence the resultant magnetic fields) will alternate (reverse polarity) at the same time, and hence the mechanical force generated is always in the same direction. In practice, the motor must be specially designed to cope with the AC current (impedance must be taken into account, as must the pulsating force), and the resultant motor is generally less efficient than an equivalent pure DC motor. Operating at normal power line frequencies, the maximum output of universal motors is limited and motors exceeding one kilowatt are rare. But universal motors also form the basis of the traditional railway traction motor. In this application, to keep their electrical efficiency high, they were operated from very low frequency AC supplies, with 25 Hz and 16 2/3 hertz operation being common. Because they are universal motors, locomotives using this design were also commonly capable of operating from a third rail powered by DC. The advantage of the universal motor is that AC supplies may be used on motors which have the typical characteristics of DC motors, specifically high starting torque and very compact design if high running speeds are used. The negative aspect is the maintenance and short life problems caused by the commutator. As a result such motors are usually used in AC devices such as food mixers and power tools, which are used only intermittently. Continuous speed control of a universal motor running on AC is very easily accomplished using a thyristor circuit, while stepped speed control can be accomplished using multiple taps on the field coil. Household blenders that advertise many speeds frequently combine a field coil with several taps and a diode that can be inserted in series with the motor (causing the motor to run on half-wave DC with 0.707 of the RMS voltage of the AC power line). Unlike AC motors, universal motors can easily exceed one revolution per cycle of the mains current. This makes them useful for appliances such as blenders, vacuum cleaners, and hair dryers where high-speed operation is desired. Many vacuum cleaner and weed trimmer motors will exceed 10,000 RPM, Dremel and other similar miniature grinders will often exceed 30,000 RPM. A theoretical universal motor allowed to operate with no mechanical load will overspeed, which may damage it. In real life, though, various bearing frictions, armature "windage," and the load of any integrated cooling fan all act to prevent overspeed. With the very low cost of semiconductor rectifiers, some applications that would have previously used a universal motor now use a pure DC motor, usually with a permanent magnet field. This is especially true if the semiconductor circuit is also used for variable-speed control. The advantages of the universal motor and alternating-current distribution made installation of a low-frequency traction current distribution system economical for some railway installations. At low enough frequencies, the motor performance is approximately the same as if the motor were operating on DC. In 1882, Nikola Tesla identified the rotating magnetic field principle, and pioneered the use of a rotary field of force to operate machines. He exploited the principle to design a unique two-phase induction motor in 1883. In 1885, Galileo Ferraris independently researched the concept. In 1888, Ferraris published his research in a paper to the Royal Academy of Sciences in Turin. Introduction of Tesla's motor from 1888 onwards initiated what is known as the Second Industrial Revolution, making possible the efficient generation and long distance distribution of electrical energy using the alternating current transmission system, also of Tesla's invention (1888). Before the invention of the rotating magnetic field, motors operated by continually passing a conductor through a stationary magnetic field (as in homopolar motors). Tesla had suggested that the commutators from a machine could be removed and the device could operate on a rotary field of force. Professor Poeschel, his teacher, stated that would be akin to building a perpetual motion machine. Tesla would later attain U.S. Patent 0416194 (PDF), Electric Motor (December 1889), which resembles the motor seen in many of Tesla's photos. This classic alternating current electromagnetic motor was an induction motor. In the induction motor, the field and armature were ideally of equal field strengths and the field and armature cores were of equal sizes. The total energy supplied to operate the device equaled the sum of the energy expended in the armature and field coils. The power developed in operation of the device equaled the product of the energy expended in the armature and field coils. Michail Osipovich Dolivo-Dobrovolsky later invented a three-phase "cage-rotor" in 1890. A successful commercial polyphase system of generation and long-distance transmission was designed by Almerian Decker at Mill Creek No. 1 in Redlands California. An inside rotor attached to the output shaft that is given a torque by the rotating field. The induction motor, which turns slightly slower, and typically (though not necessarily always) takes the form of the squirrel cage motor. Where a polyphase electrical supply is available, the three-phase (or polyphase) AC induction motor is commonly used, especially for higher-powered motors. The phase differences between the three phases of the polyphase electrical supply create a rotating electromagnetic field in the motor. Through electromagnetic induction, the rotating magnetic field induces a current in the conductors in the rotor, which in turn sets up a counterbalancing magnetic field that causes the rotor to turn in the direction the field is rotating. The rotor must always rotate slower than the rotating magnetic field produced by the polyphase electrical supply; otherwise, no counterbalancing field will be produced in the rotor. Induction motors are the workhorses of industry and motors up to about 500 kW (670 horsepower) in output are produced in highly standardized frame sizes, making them nearly completely interchangeable between manufacturers (although European and North American standard dimensions are different). Very large synchronous motors are capable of tens of thousands of kW in output, for pipeline compressors, wind-tunnel drives and overland converor systems. There are two types of rotors used in induction motors. Squirrel Cage rotors: Most common AC motors use the squirrel cage rotor, which will be found in virtually all domestic and light industrial alternating current motors. The squirrel cage takes its name from its shape - a ring at either end of the rotor, with bars connecting the rings running the length of the rotor. It is typically cast aluminum or copper poured between the iron laminates of the rotor, and usually only the end rings will be visible. The vast majority of the rotor currents will flow through the bars rather than the higher-resistance and usually varnished laminates. Very low voltages at very high currents are typical in the bars and end rings; high efficiency motors will often use cast copper in order to reduce the resistance in the rotor. In operation, the squirrel cage motor may be viewed as a transformer with a rotating secondary - when the rotor is not rotating in sync with the magnetic field, large rotor currents are induced; the large rotor currents magnetize the rotor and interact with the stator's magnetic fields to bring the rotor into synchronization with the stator's field. An unloaded squirrel cage motor at synchronous speed will consume electrical power only to maintain rotor speed against friction and resistance losses; as the mechanical load increases, so will the electrical load - the electrical load is inherently related to the mechanical load. This is similar to a transformer, where the primary's electrical load is related to the secondary's electrical load. This is why, as an example, a squirrel cage blower motor may cause the lights in a home to dim as it starts, but doesn't dim the lights when its fanbelt (and therefore mechanical load) is removed. Furthermore, a stalled squirrel cage motor (overloaded or with a jammed shaft) will consume current limited only by circuit resistance as it attempts to start. Unless something else limits the current (or cuts it off completely) overheating and destruction of the winding insulation is the likely outcome. Virtually every washing machine, dishwasher, standalone fan, record player, etc. uses some variant of a squirrel cage motor. Wound Rotor: An alternate design, called the wound rotor, is used when variable speed is required. In this case, the rotor has the same number of poles as the stator and the windings are made of wire, connected to slip rings on the shaft. Carbon brushes connect the slip rings to an external controller such as a variable resistor that allows changing the motor's slip rate. In certain high-power variable speed wound-rotor drives, the slip-frequency energy is captured, rectified and returned to the power supply through an inverter. Several methods of starting a polyphase motor are used. Where the large inrush current and high starting torque can be permitted, the motor can be started across the line, by applying full line voltage to the terminals (Direct-on-line, DOL). Where it is necessary to limit the starting inrush current (where the motor is large compared with the short-circuit capacity of the supply), reduced voltage starting using either series inductors, an autotransformer, thyristors, or other devices are used. A technique sometimes used is star-delta starting, where the motor coils are initially connected in wye for acceleration of the load, then switched to delta when the load is up to speed. This technique is more common in Europe than in North America. Transistorized drives can directly vary the applied voltage as required by the starting characteristics of the motor and load. This type of motor is becoming more common in traction applications such as locomotives, where it is known as the asynchronous traction motor. The speed in this type of motor has traditionally been altered by having additional sets of coils or poles in the motor that can be switched on and off to change the speed of magnetic field rotation. However, developments in power electronics mean that the frequency of the power supply can also now be varied to provide a smoother control of the motor speed. If connections to the rotor coils of a three-phase motor are taken out on Slip-rings and fed a separate field current to create a continuous magnetic field (or if the rotor consists of a permanent magnet), the result is called a synchronous motor because the rotor will rotate in synchronism with the rotating magnetic field produced by the polyphase electrical supply. 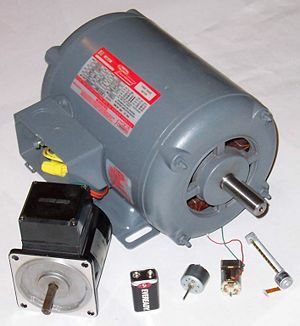 The synchronous motor can also be used as an alternator. Nowadays, synchronous motors are frequently driven by transistorized variable-frequency drives. This greatly eases the problem of starting the massive rotor of a large synchronous motor. They may also be started as induction motors using a squirrel-cage winding that shares the common rotor: once the motor reaches synchronous speed, no current is induced in the squirrel-cage winding, so it has little effect on the synchronous operation of the motor, aside from stabilizing the motor speed on load changes. Synchronous motors are occasionally used as traction motors. A typical two-phase AC servo motor has a squirrel-cage rotor and a field consisting of two windings: 1) a constant-voltage (AC) main winding, and 2) a control-voltage (AC) winding in quadrature with the main winding so as to produce a rotating magnetic field. The electrical resistance of the rotor is made high intentionally so that the speed-torque curve is fairly linear. Two-phase servo motors are inherently high-speed, low-torque devices, heavily geared down to drive the load. Three-phase motors inherently produce a rotating magnetic field. However, when only single-phase power is available, the rotating magnetic field must be produced using other means. Several methods are commonly used. A common single-phase motor is the shaded-pole motor, which is used in devices requiring low torque, such as electric fans or other small household appliances. In this motor, small single-turn copper "shading coils" create the moving magnetic field. Part of each pole is encircled by a copper coil or strap; the induced current in the strap opposes the change of flux through the coil (Lenz's Law), so that the maximum field intensity moves across the pole face on each cycle, thus producing the required rotating magnetic field. Another common single-phase AC motor is the split-phase induction motor, commonly used in major appliances such as washing machines and clothes dryers. Compared to the shaded pole motor, these motors can generally provide much greater starting torque by using a special startup winding in conjunction with a centrifugal switch. In the split-phase motor, the startup winding is designed with a higher resistance than the running winding. This creates an LR circuit which slightly shifts the phase of the current in the startup winding. When the motor is starting, the startup winding is connected to the power source via a set of spring-loaded contacts pressed upon by the not-yet-rotating centrifugal switch. The phase of the magnetic field in this startup winding is shifted from the phase of the mains power, allowing the creation of a moving magnetic field which starts the motor. Once the motor reaches near design operating speed, the centrifugal switch activates, opening the contacts and disconnecting the startup winding from the power source. The motor then operates solely on the running winding. The starting winding must be disconnected since it would increase the losses in the motor. In a capacitor start motor, a starting capacitor is inserted in series with the startup winding, creating an LC circuit which is capable of a much greater phase shift (and so, a much greater starting torque). The capacitor naturally adds expense to such motors. Another variation is the Permanent Split-Capacitor (PSC) motor (also known as a capacitor start and run motor). This motor operates similarly to the capacitor-start motor described above, but there is no centrifugal starting switch and the second winding is permanently connected to the power source. PSC motors are frequently used in air handlers, fans, and blowers and other cases where a variable speed is desired. Repulsion motors are wound-rotor single-phase AC motors that are similar to universal motors. In a repulsion motor, the armature brushes are shorted together rather than connected in series with the field. Several types of repulsion motors have been manufactured, but the repulsion-start induction-run (RS-IR) motor has been used most frequently. The RS-IR motor has a centrifugal switch that shorts all segments of the commutator so that the motor operates as an induction motor once it has been accelerated to full speed. RS-IR motors have been used to provide high starting torque per ampere under conditions of cold operating temperatures and poor source voltage regulation. Few repulsion motors of any type are sold as of 2006. Small single-phase AC motors can also be designed with magnetized rotors (or several variations on that idea). The rotors in these motors do not require any induced current so they do not slip backward against the mains frequency. Instead, they rotate synchronously with the mains frequency. Because of their highly accurate speed, such motors are usually used to power mechanical clocks, audio turntables, and tape drives; formerly they were also much used in accurate timing instruments such as strip-chart recorders or telescope drive mechanisms. The shaded-pole synchronous motor is one version. A torque motor is a specialized form of induction motor which is capable of operating indefinitely at stall (with the rotor blocked from turning) without damage. In this mode, the motor will apply a steady torque to the load (hence the name). A common application of a torque motor would be the supply- and take-up reel motors in a tape drive. In this application, driven from a low voltage, the characteristics of these motors allow a relatively-constant light tension to be applied to the tape whether or not the capstan is feeding tape past the tape heads. Driven from a higher voltage, (and so delivering a higher torque), the torque motors can also achieve fast-forward and rewind operation without requiring any additional mechanics such as gears or clutches. In the computer world, torque motors are used with force feedback steering wheels. Closely related in design to three-phase AC synchronous motors are stepper motors, where an internal rotor containing permanent magnets or a large iron core with salient poles is controlled by a set of external magnets that are switched electronically. A stepper motor may also be thought of as a cross between a DC electric motor and a solenoid. As each coil is energized in turn, the rotor aligns itself with the magnetic field produced by the energized field winding. Unlike a synchronous motor, in its application, the motor may not rotate continuously; instead, it "steps" from one position to the next as field windings are energized and de-energized in sequence. Depending on the sequence, the rotor may turn forwards or backwards. A permanent magnet motor is the same as the conventional dc motor except the fact that the field winding is replaced by permanent magnets. By doing this, the motor would act like a constant excitation dc motor (separately excited dc motor). These motors usually have a small rating, ranging up to a few horsepower. They are used in small appliances, battery operated vehicles, for medical purposes, in other medical equipment such as x-ray machines. These motors are also used in toys, and in automobiles as auxiliary motors for the purposes of seat adjustment, power windows, sunroof, mirror adjustment, blower motors, engine cooling fans and the like. Many of the limitations of the classic commutator DC motor are due to the need for brushes to press against the commutator. This creates friction. At higher speeds, brushes have increasing difficulty in maintaining contact. Brushes may bounce off the irregularities in the commutator surface, creating sparks. This limits the maximum speed of the machine. The current density per unit area of the brushes limits the output of the motor. The imperfect electric contact also causes electrical noise. Brushes eventually wear out and require replacement, and the commutator itself is subject to wear and maintenance. The commutator assembly on a large machine is a costly element, requiring precision assembly of many parts. These problems are eliminated in the brushless motor. In this motor, the mechanical "rotating switch" or commutator/brushgear assembly is replaced by an external electronic switch synchronized to the rotor's position. Brushless motors are typically 85-90 percent efficient, whereas DC motors with brushgear are typically 75-80 percent efficient. Midway between ordinary DC motors and stepper motors lies the realm of the brushless DC motor. Built in a fashion very similar to stepper motors, these often use a permanent magnet external rotor, three phases of driving coils, one or more Hall effect devices to sense the position of the rotor, and the associated drive electronics. A specialized class of brushless DC motor controllers utilize EMF feedback through the main phase connections instead of Hall effect sensors to determine position and velocity. 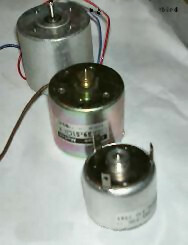 These motors are used extensively in electric radio-controlled vehicles, and referred to by modelists as outrunner motors (since the magnets are on the outside). Without a commutator to wear out, the life of a DC brushless motor can be significantly longer compared to a DC motor using brushes and a commutator. Commutation also tends to cause a great deal of electrical and RF noise; without a commutator or brushes, a brushless motor may be used in electrically sensitive devices like audio equipment or computers. The same Hall effect devices that provide the commutation can also provide a convenient tachometer signal for closed-loop control (servo-controlled) applications. In fans, the tachometer signal can be used to derive a "fan okay" signal. Brushless motors have no chance of sparking, unlike brushed motors, making them better suited to environments with volatile chemicals and fuels. Modern DC brushless motors range in power from a fraction of a watt to many kilowatts. Larger brushless motors up to about 100 kW rating are used in electric vehicles. They also find significant use in high-performance electric model aircraft. Nothing in the design of any of the motors described above requires that the iron (steel) portions of the rotor actually rotate; torque is exerted only on the windings of the electromagnets. Taking advantage of this fact is the coreless DC motor, a specialized form of a brush DC motor. Optimized for rapid acceleration, these motors have a rotor that is constructed without any iron core. The rotor can take the form of a winding-filled cylinder inside the stator magnets, a basket surrounding the stator magnets, or a flat pancake (possibly formed on a printed wiring board) running between upper and lower stator magnets. The windings are typically stabilized by being impregnated with epoxy resins. Because the rotor is much lighter in weight (mass) than a conventional rotor formed from copper windings on steel laminations, the rotor can accelerate much more rapidly, often achieving a mechanical time constant under 1 ms. This is especially true if the windings use aluminum rather than the heavier copper. But because there is no metal mass in the rotor to act as a heat sink, even small coreless motors must often be cooled by forced air. These motors were commonly used to drive the capstan(s) of magnetic tape drives and are still widely used in high-performance servo-controlled systems. A linear motor is essentially an electric motor that has been "unrolled" so that, instead of producing a torque (rotation), it produces a linear force along its length by setting up a traveling electromagnetic field. Linear motors are most commonly induction motors or stepper motors. You can find a linear motor in a maglev (Transrapid) train, where the train "flies" over the ground. Doubly-fed electric motors or Doubly-Fed Electric Machines incorporate two independently powered multiphase winding sets that actively participate in the energy conversion process (i.e., doubly-fed) with at least one of the winding sets electronically controlled for synchronous operation from sub-synchronous to super synchronous speeds. As a result, doubly-fed electric motors are synchronous machines with an effective constant torque speed range that is twice synchronous speed for a given frequency of excitation. This is twice the constant torque speed range as Singly-Fed Electric Machines, which incorporate a single active winding set. In theory, this attribute has attractive cost, size, and efficiency ramifications compared to Singly-Fed Electric Machines but Doubly-fed motors are difficult to realize in practice. The Wound-Rotor Doubly-Fed Electric Machines, the Brushless Wound-Rotor Doubly-Fed Electric Machine, and the so-called Brushless Doubly-Fed Electric Machines are the only examples of synchronous doubly-fed electric machines. Singly-fed electric motors or Singly-Fed Electric Machines incorporate a single multiphase winding set that actively participate in the energy conversion process (i.e., singly-fed). Singly-fed electric machines operate under either Induction (i.e., Asynchronous) or Synchronous principles. The active winding set can be electronically controlled for optimum performance. Induction machines exhibit startup torque and can operate as standalone machines but Synchronous machines must have auxiliary means for startup and practical operation, such as an electronic controller. The Induction (Asynchronous) motors (i.e., squirrel cage rotor or wound rotor), Synchronous motors (i.e., field-excited, Permanent Magnet or brushless DC motors, Reluctance motors, etc. ), which are discussed on this page, are examples of Singly-fed motors. By far, Singly-fed motors are the predominantly installed type of motors. The Dual Mechanical Port Electric Motors (or DMP electric motor) is considered a new electric motor concept. More accurately, DMP electric motors are actually two electric motors (or generators) occupying the same package. Each motor operates under traditional electric motor principles. The electrical ports, which may include electronic support, of the electric motors are tied to a single electrical port while two mechanical ports (shafts) are available externally. Theoretically, the physical integration of the two motors into one is expected to increase power density by efficiently utilizing otherwise wasted magnetic core real-estate. The mechanics of the integration, such as for the two mechanical shafts, may be quite exotic. Researchers at University of California, Berkeley, have developed rotational bearings based upon multiwall carbon nanotubes. By attaching a gold plate (with dimensions of order 100nm) to the outer shell of a suspended multiwall carbon nanotube (like nested carbon cylinders), they are able to electrostatically rotate the outer shell relative to the inner core. These bearings are very robust; Devices have been oscillated thousands of times with no indication of wear. The work was done in situ in an SEM. These nanoelectromechanical systems (NEMS) are the next step in miniaturization that may find their way into commercial aspects in the future. The process and technology can be seen in this render. The counter-emf aids the armature resistance to limit the current through the armature. When power is first applied to a motor, the armature does not rotate. At that instant the counter-emf is zero and the only factor limiting the armature current, is the armature resistance. Usually the armature resistance of a motor is less than one ohm; therefore the current through the armature would be very large when the power is applied. This current can make an excessive voltage drop, affecting other equipment in the circuit. Or merely trip overload protective devices. Therefore the need arises for an additional resistance in series with the armature to limit the current until the motor rotation can build up the counter-emf. As the motor rotation build up, the resistance is gradually cut out. The incoming power is indicated as L1 and L2. The components within the broken lines form the three-point starter. As the name implies there are only three connections to the starter. The connections to the armature are indicated as A1 and A2. The ends of the field (excitement) coil are indicated as F1 and F2. In order to control the speed, A field rheostat is connected in series with the shunt field. One side of the line is connected to the arm of the starter (represented by an arrow in the diagram). The arm is spring-loaded so, it will return to the "Off" position the not held at any other position. On the first step of the arm, full line voltage is applied across the shunt field. Since the field rheostat is normally set to minimum resistance, the speed of the motor will not be excessive; additionally, the motor will develop a large starting torque. The starter also connects an electromagnet in series with the shunt field. It will hold the arm in position when the arm makes contact with the magnet. Meanwhile that voltage is applied to the shunt field, and the starting resistance limits the flow of current to the armature. As the motor picks up speed counter-emf is built up, the arm is moved slowly to short. The four-point starter eliminates the drawback of the three-point starter. In addition to the same three points that were in use with the three-point starter, the other side of the line, L1, is the fourth point brought to the starter. When the arm is moved from the "Off" position, the coil of the holding magnet is connected across the line. The holding magnet and starting resistors function identical as in the three-point starter. The possibility of accidentally opening the field circuit is quite remote. The four-point starter provides the no-voltage protection to the motor. If the power fails, the motor is disconnected from the line. ↑ Tesla's Early Years PBS.org. ↑ U.S. Patent 0416194, "Electric Motor," December 1889. Chiasson, John N. 2005. Modeling and High Performance Control of Electric Machines, New York, NY: Wiley-IEEE Press. ISBN 047168449X. Fink, Donald G.; Beaty, H. Wayne (1978). Standard Handbook for Electrical Engineers, Eleventh Edition. New York, NY: McGraw-Hill. ISBN 007020974X. Fitzgerald, A. E., Charles Kingsley Jr., Stephen D. Umans. 2002. Electric Machinery. Columbus, OH: McGraw-Hill Science/Engineering/Math. ISBN 0073660094. Kuphaldt, Tony R. Lessons In Electric Circuits — Volume II. 2000-2006. Chapter 13 AC MOTORS. accessdate 2006-04-11. Shanefield D. J. (2001). Industrial Electronics for Engineers, Chemists, and Technicians. Norwich, NY: William Andrew Publishing. ISBN 0815514670. This page was last modified on 18 September 2017, at 21:49.